Wrapping yourself in a soft white towel after a shower is a simple pleasure. Unfortunately, after a while all white towels can become slightly dingy, despite regular washing. Nothing is less appealing than a dingy gray towel that used to be white. People often think it's impossible to restore their towels to their original brightness. Instead, they give up and buy new towels. Fortunately, a few simple techniques can keep your whites white. With basic household products, you can whiten your white towels and keep them looking bright for a long time. Presoak your white towels in a basin with 1/3 cup of baking soda and the appropriate amount of laundry detergent for the size of your load. Soak the towels for 20 minutes. Rinse the towels thoroughly with cold water. Launder the towels in the washing machine, using OxiClean or a similar product. Read the packaging to determine how much to put in per load. 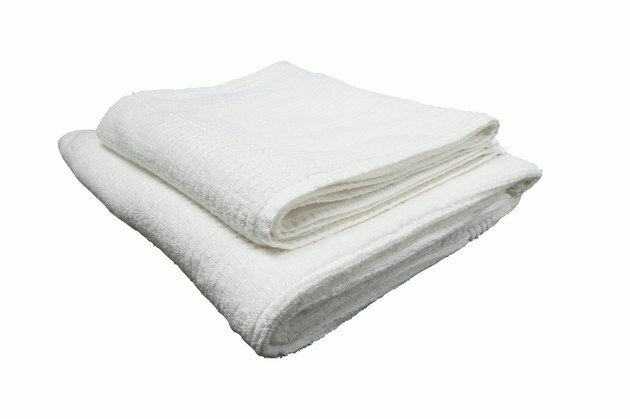 Wash white towels in hot water with laundry detergent, as usual. Always use the hottest water that the towels will allow. This helps remove stubborn marks. Rinse twice. If your washing machine has an "extra rinse" option, select it. Otherwise, plan to run your load through the washing cycle twice, the second time without detergent.